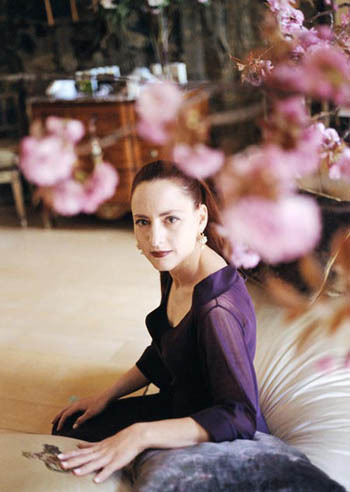 Aroma M, an indie line created by perfumer Maria McElroy is inspired by Japanese Geisha culture. Maria lived in Japan for years and her immersion in the culture is deeply ingrained in her interesting and beautiful work. To make it clear upfront, this is a topic I know nothing about. Sure, I could read up on it and regurgitate newly acquired facts here, but I’ll do something else instead: Tarleisio has already written wonderful pieces about geishas and japanese traditions along with her inimitable reviews of Aroma M.
What I can do is review the perfumes, share my thoughts on the fragrances themselves, about that, I do know a little bit. Although that was the second problem I ran into, I initially planned to do mini-reviews of all the perfumes, since mini-reviews are what people like and ask for, and a compact line like Aroma M (where I also have all the samples thanks to Maria’s generosity) is predestined to be reviewed all at once. Somehow this approach didn’t work for me. Instead of happily diving into the scented world of Geishas, I found myself strongly drawn to one perfume, so much so that I couldn’t even bring myself to properly try the others, let alone wear and subsequently review them. Obviously this one perfume, the one to trap me and make me unreceptive to others, is the one I should take a deeper look at first. Maybe when I review it first, all the others will get their chances. Geisha Noire includes notes of black amber, sandalwood and tonka bean. It is said to have aromatherapeutic properties and “combats stress, clears the thought processes, undoes the inhibitions, assists in meditation and prayer”. Maybe that explains my craving for it. That, and the form incomes in. 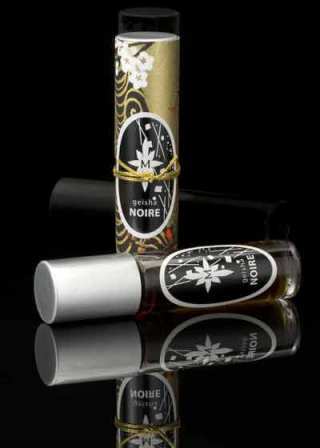 There is an Eau de Parfum of Geisha Noire, but its primary form and the one I tried, is a perfume oil. This richly dark brown oil is a major factor of attraction for me. I apply it and it feels like a caress, I love how my skin gets soft and perfumed, it feels like a ritual, a calming ritual that certainly helps to combat stress. Application alone makes me smile and relax. Geisha Noire is a powerful perfume. It is rich in spices, dark, sweet and very powdery on my skin. It is a perfume of old, meaning it makes a statement and is as far from fresh and clean as I am from speaking Japanese. There is a smoky note that diffuses the dense, enveloping nature of Geisha Noire a bit, but still this is no lightweight, on the other hand I can wear this throughout the day, since the oil stays close to me, for all its weight and warmth, Geisha Noire is entirely comfortable to wear. But, then again, as a word of caution, I don’t sit in the closed environment of an office all day. I have heard many pronounce it not office-appropriate. Geisha Noire has very good tenacity, it lasts the day. From a smoky and spicy opening, Geisha Noire develops into a softly powdery and sweet drydown that is very beautiful and comforting. The first hour can be a bit much sometimes, but after that it is pure bliss. I love to wear Geisha Noire, it is warm and enveloping and not just a bit sensual as well. 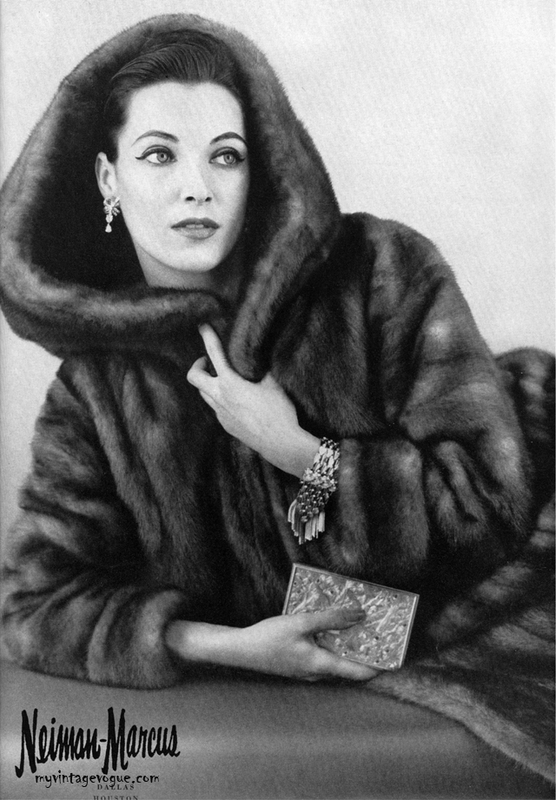 Like I imagine a vintage fur coat to feel, luxurious, heavy and warm. Geisha Noire had me at Hello, and it keeps my attention and devotion, until it bids a soft, powdery farewell the next morning. This entry was posted in Amber, Aroma M, Floral, Fragrance Reviews, Green, Oriental and tagged Amber, Aroma M, floral, Fragrance, Geisha Blanche, Geisha Green, Geisha Noir, Geisha Perfumes, green, Maria McElroy, Perfume, Review. Bookmark the permalink. I haven’t explored this line – this sounds like a lovely scent. New lemmings!! I love the oil consistency, it makes applying perfume twice as nice. I like it, that is enough for me. Geisha Noire is perfect for when the weather turns cold and unfriendly. And you are so right, good packaging is definitely important! This sounds heavenly. I love ambers myself and the image of a smoky, intense amber is compelling! Did the other fragrances not stand up to Geisha Noire then? I have read reviews on these – on Parfumieren, I think it was – and have been curious to try them, not least because of the gorgeous packaging, reason alone to have a particular favourite! 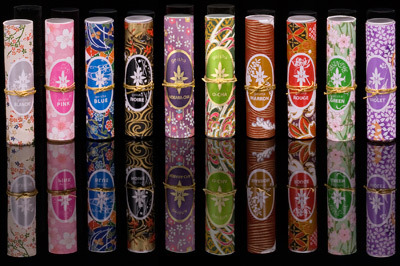 I think I would lke Geisha Noire – the packaging is certainly up with the best! – but like you, might find it a bit potent initially. Slightly off-topic, though you do touch on the the aromatherapy properties of this scent, I was rereading your post on perfume as pain relief (I may be paraphrasing here), as my sister-in-law is after some recs for a Slovenian friend going through intensive chemo. She is feeling nauseous obviously – do you suppose perfume could help or hinder that? To answer you first, it is surely a question of individual preference, but generally I think a person undergoing chemo doesn’t tolerate smells very well, so I think perfume may not be a good idea when she feels nauseous. In less acute phases between treatments she may enjoys soft scents. though. I would consult an aromatherapy specialist (books, internet) about what is recommended. Thanks for the help on the chemo scents – will pass on your tips to my sister-in-law. Funnily enough, when I saw Olenska’s reviews I am pretty sure it was Blue and/or Blanche that caught my eye as likely candidates for me, though your luscious prose makes so many scents that may not be my style sound appealing! Just went to check if I have remembered right but O’s blog seems to have disappeared for some reason. Olenska has a new url, go through my blog roll, I updated the link! A favorite of mine, I have both the edp and the oil, and adore the dark spicy richness of it, it really smells like something that should much more expensive… but I’m glad that it’s not!